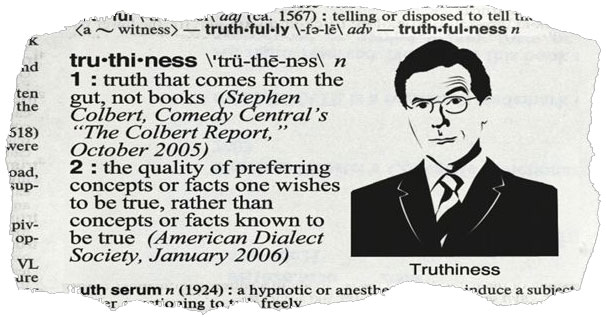 In October 2005, in the first ever episode of The Colbert Report, Stephen Colbert introduced the world to a new word – “Truthiness“. Now you may be asking “what does any of this have to do with EU ‘benefit tourism’ in the UK?” If so, allow me to explain. On the 15th September, I published a post “Evidence Not Ideology: Benefit Tourism The Problem Only Fruitloops And Tories Can See“. In that post, based on an article from the Observer, I highlighted (again) how David Cameron‘s time as Prime Minister has continued to produce policy based on ideology or, in the case of immigration and alleged ‘benefit tourism‘, party political and 2015 electoral concerns rather than facts or meaningful evidence of any kind. “despite several requests the government has failed to offer anything more than anecdotal claims to back its assertion that “social benefit tourism” is a real problem”. “….a joint report by the CEBR and global recruitment consultancy Harvey Nash has concluded that any measures to restrict freedom of movement to the UK from other parts of the EU would have a devastating effect on the British economy, because EU citizens are more likely to be in work and are more productive than British-born workers. The report says that curbing immigration from other parts of the EU could cost the UK £60bn in lost GDP (2% in real terms) by 2050….. So whilst not wholly conclusive, it would not be unfair to characterise the absence of evidence to support the UKIP/Daily Mail ‘fantasy’ of millions of EU migrants rushing to the UK to sign-on and ‘sponge’ off of the UK taxpayer as exactly that – a fantasy. Imagine my surprise when, this week, the Sunday Telegraph published an article claiming to have discovered an “authoritative study” that “has found 600,000 unemployed migrants are living in Britain”. This article was then regurgitated, rather lazily, by the Daily Mail the next day. Any way that you look at it, 600,000 “unemployed” EU migrants languishing on the dole IS a problem…… or at least it would be if it were true…. which of course it is not. It is, however, truthy and in the following clip I will attempt to show you why. Truthiness has been ruinous for this country. As our politicians and media become increasingly adept at appealing to your gut rather than your head ask yourself if we could all be better off if things were done a different way.